Perhaps the biggest question in astrology is the one between fate and free will. How much does our chart insist on certain things happening to us ? How much freedom of choice do we have ? Does our chart indicate the type of stimulus we will receive in life, but its up to us how we react to it ? Do birth charts have a uniform impact, or are some people more strongly affected by the symbols at birth than others ? What about our own death, is that already programmed in or not ? None of these questions can have definitive answers, we just have to keep on looking at charts of ourselves and others to see what happens, and adjust our opinions according to our observations. Elio De Angelis was a Formula One racing driver who died in a car crash in 1986. If he had chosen, to work in an office like most other people would he have died in the same year, in some kind of work related accident ? Or did he have any choice in his career in the first place ? De Angelis has the Sun right at the very end of Pisces closely conjunct the Moon at the beginning of Aries. Planets at the very end of a sign always cause a few problems for astrologers. Traditional astrologers would say that such a planet has very little power left in that sign. But it is also fast applying to the beginning of the next one. 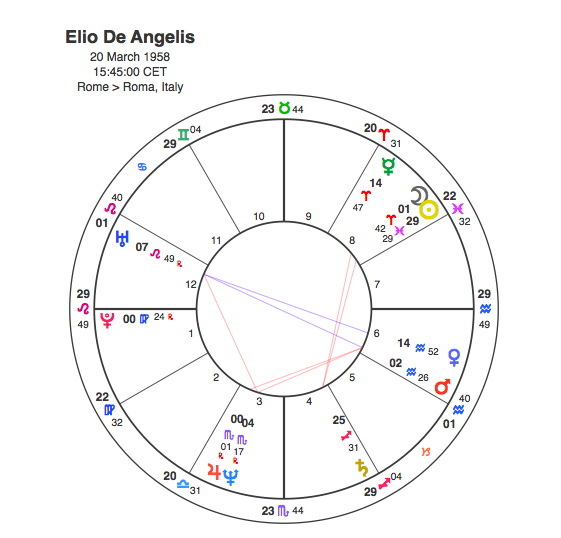 So a case could be made for De Angelis having both the Sun and Moon effectively in Aries. As a racing driver this would certainly make sense. The strongest Sun sign in Capricorn Research’s collection of 106 Motor Racing Drivers in Aries with 18, a score of 204% of the expected figure. This distribution is so powerful that it has a gobsmacking statistical p figure score of 0.000186, almost unheard of in a sample that size. But even if we insist that De Angelis’ Sun is not yet in Aries, it still works as the 2nd highest scoring sign with 16 ( 181% ) is Pisces. The fearless Leo is the most common rising sign in this group with a score of 139 %. The most common aspect pairing is Mars and Uranus with the unusual combination of all 5 major aspects scoring above average, but particularly the square with 184 % and the opposition which De Angelis has at 149 %. Of course the hard aspects between Mars and Uranus are also the classic harbingers of accidents, a reputation that is supported by Capricorn Research’s collection of 230 Accidents ( not including air crashes ) which gives the opposition aspect between these two a score of 147 %. Many people would say that a career in motor racing is almost inevitably going to bring an accident at some stage or another so De Angelis’ Mars in Aquarius opposite Uranus covers both themes. Fortunately not many drivers die from these accidents but there are some fairly clear indications that Elio De Angelis would meet his end in this way. 1. The Sun / Moon conjunction is in the 8th house of death. 2. Pluto, the planet that rules death is closely conjunct the Ascendant. 3. Pluto is closely inconjunct the Sun and Moon. The inconjunction ( 150 degrees ) is an aspect that has its own connections with health and death owing to its angular association with the 6th and 8th houses. 4. The Mars / Uranus opposition forms a T square with Jupiter and Neptune as apex planets in Scorpio, the sign most closely associated with death. 5. Jupiter at the apex of the T Square is also inconjunct the Sun and Moon, creating a Finger of Fate aspect with Pluto. 6. Both the Sun and Moon are in square aspect to Saturn, the planet that rules endings. In 1986 when the fatal car crash occurred, Pluto made its only aspect to Elio De Angelis’s T Square conjunct Neptune and square Uranus at the time. Many astrologers would say that you can’t see a person’s death in a chart, but if they still believed that to be so in this case it would surely be because they weren’t looking properly. Elio De Angelis’ tragic death in his racing car is one of the clearest indications of the hand of fate that Capricorn Research has seen. Maybe we do have free will and the opportunity to choose our own destiny but when we see charts like this it really makes you wonder.